One of the most popular year-round hikes in the Chuckanut Mountains, south of Bellingham, the Oyster Dome trail finally got a needed face-lift — spruced up, rerouted and extended by 0.3 mile. If you haven’t been back on this much-loved trail recently, it’s time for a fresh look. The maintenance has been done near the summit, where the fall-line trail had eroded due to rainwater cascading down the steep path, to say nothing of the thousands of booted feet on this muddy stretch every year. In mid-July, with help from Washington Trails Association, Washington Conservation Corps and the Northwest Youth Corps, the state Department of Natural Resources rerouted the straight, vertical trail by adding a handful of switchbacks to create a zigzag path to the summit, creating a longer but easier hike — flatter and less slippery. 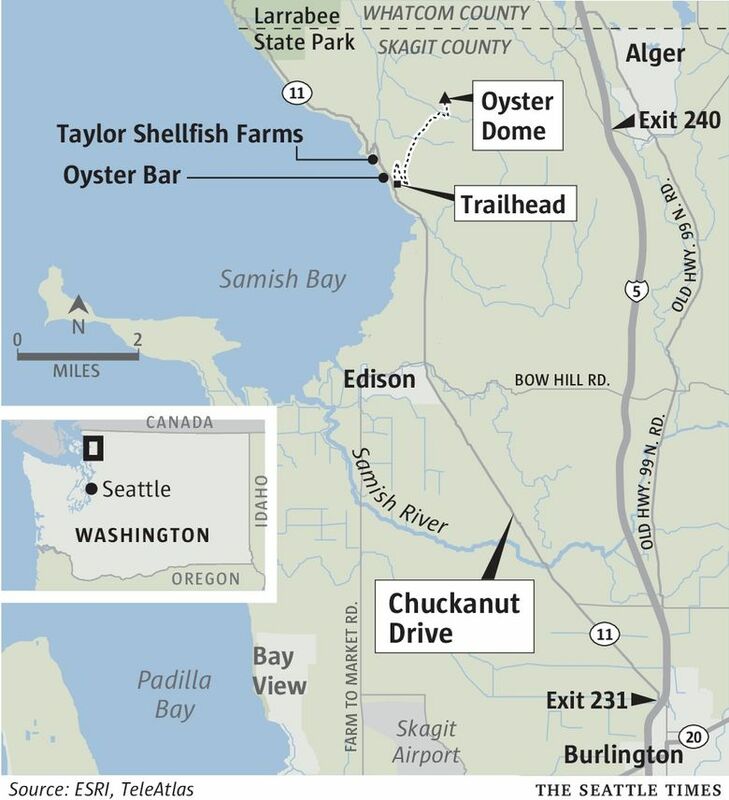 One project remains: the last 500 feet onto the rocky, domelike promontory that overlooks waters where oysters have long been harvested (Taylor Shellfish Farms still operates on the shoreline below). This top stretch of trail was washed out and needs to be reconstructed with a couple of switchbacks and a few rock-and-log steps. DNR hopes to secure grants to fix that section in December or early 2017. 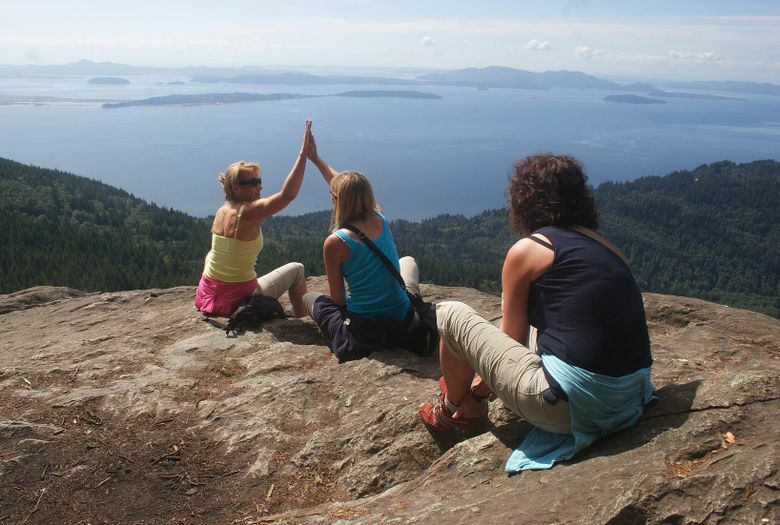 The hike: There are several ways to Oyster Dome. The hike described here (7.1 miles round trip with 1,900 feet of elevation gain) starts from Chuckanut Drive, near Milepost 10. There is parking on the west shoulder of the road. The trailhead is on the east side of the road. The trail starts with steep switchbacks, but the good news is you get the thigh-burning climb out of the way while you’re still fresh. A mile up, you get a view of the sweeping blue water. On our visit, two paragliders soared over Samish Bay with bald eagles in the distance. If you’re out of shape, this is a good pit stop (there’s a bench) as well as Instragram-worthy views. The hike levels off from there as it meanders through a lush forest of Douglas firs and Western hemlock interspersed with some Western red cedar. 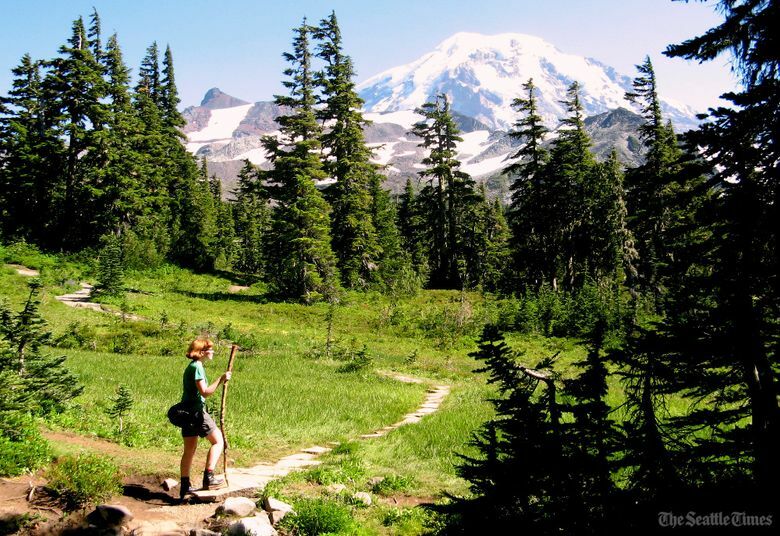 You cross over three shallow runoffs, but instead of another steep climb, you’re rerouted to a flatter and, more importantly, a drier and safer hike. The forested hike opens onto the Oyster Dome, with a bird’s-eye view of Anacortes and the Skagit River to the left and Lummi and Orcas islands to the right. On a clear day, look out to Vancouver Island and the Olympics. Restrictions: Leash law in effect. Not wheelchair accessible. Discover Pass required. Directions: From Interstate 5 in Skagit County, take Exit 231. Follow Chuckanut Drive, Highway 11, to just past Milepost 10. Park on the southbound shoulder, well out of the traffic lane. Do not park in the nearby Oyster Bar restaurant parking lot or on private property. For a shorter, easier hike start at Samish Overlook. To get there, take Exit 240 from Interstate 5. Turn northwest on Lake Samish Road. Go a half-mile to Barrel Springs Road and turn left. Go 0.6 mile and turn right on DNR Road B1000, then drive 3.8 miles to Blanchard Forest Block, and to Samish Overlook.